I explained to my son how my shadow was cast almost straight down at noon when we were 12˚south of the equator in Peru. That had never happened to me before. 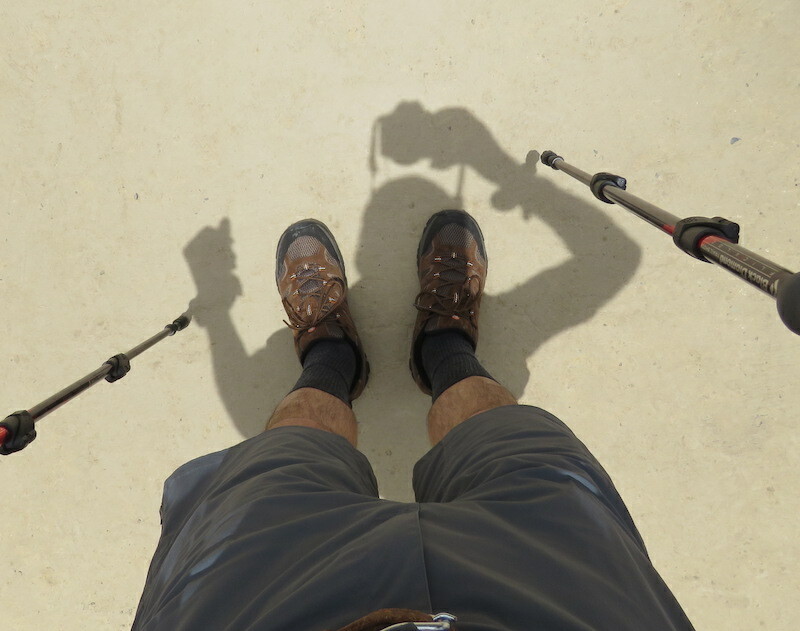 Living 42˚north of the equator, we always cast shadows. They are short in the summer when the Sun is high in the sky and long in the winter when the Sun is low. But, never straight down like this. My son posed a question about sunrises at the equator. “Does the Sun rise straight up due east each day of the year.” I said it doesn’t rise due east every day. But, it does rise nearly straight up. He acted skeptical. It was time to use desktop planetarium software to simulate the view. Suppose you are at the equator looking east at sunrise on 20 April. You watch the Sun for 2 hours. It rises basically straight up and is a little north of due East. It would be due east on the equinoxes in March and September. Simulated lens flare is a nice effect. Next, suppose you are at the 42˚north latitude looking east at sunrise again on 20 April. You watch the Sun for 2 hours. Because you moved north around the curve of the Earth, the Sun doesn’t rise straight up. It rises at an angle to the horizon. It is north of due east when it starts. What do you predict for sunrise at the North Pole on 20 April? If you said there is no sunrise on that date, you are correct. You moved around the curve of the Earth 90˚ from the equator. The Sun will move horizontally and travel around you, never rising or setting. Notice the directional markers on the horizon all say South. Suppose you are again at the equator looking east. It is now 8 am and the Sun has risen. The video advances monthly at 8 am starting in March to show where the Sun is in the sky during the mornings of the year. It advances north of east then goes south of east before returning. Perhaps you also noticed a sort of figure-eight was traced. That figure is called an analemma and deserves a post of its own. Next, watch the Sun from 42˚north latitude. It traces the same analemma pattern as before. But, the analemma is tilted 42˚. When it is north of east, it is summer in the northern hemisphere. Lastly, suppose you are at the north pole and note the position of the Sun at 8 am throughout the year. Predict what you will see before playing the video. Half the year the Sun is always above the horizon and half the year it is always below the horizon. At the poles, the Sun travels around the horizon each passing day. In the summer months, it is above the horizon as it goes around. In the winter, it is below the horizon. Each day there is a slight vertical shift in its track due to our inclination and location as we orbit the Sun. If we left a camera shutter open for a year-long time exposure, the Sun would trace a vertical spiral path in the image. This video simulates the view at the North Pole during the first two weeks of April. It will continue the upward advance until the summer solstice in June. Then, it tracks down daily reaching its southernmost extent at the winter solstice in December. This is great, Jim. Thank you. One of the surprises living in Panama was the near equal days and nights – 12 and 12 hours of each. Another was the drag-race like speed of sunrises and sunsets. Pretty awesome! We didn’t have many opportunities to see the times of rises and sets. I understand what you’re saying. I have lived in the same house nearly 30 years and have followed the points of the rising (and setting) sun, as well as the moon. It was only a few years ago that I realized that the sun and moon are opposite on their paths at the solstices, reversing every six months. At the equinoxes, they are about the same place on the horizon. I’m glad you keep track. I like the permanence and predictability if offers in this world with so much uncertainty. I feel much the same way. Nature grounds me. Of course, Mandalay, now Burma, is about 22N, so the effect wouldn’t be quite so dramatic, except in the poem. I like that. You seem to have been around to many places in the world. Good for you. Great way to explain the sun rise. Living in the US the sun is straight up. Thanks. I don’t understand your ‘straight up’ comment. Very interesting post. Good videos simulating the sun rising.